Sorry that I couldn't use ubuntu-bug, LP crashed on me when trying. Attaching logs manually. Use of uninitialized value $template in exists at /usr/share/perl5/Debconf/Template.pm line 81, <GEN2> chunk 1. Use of uninitialized value $item in exists at /usr/share/perl5/Debconf/DbDriver/Cache.pm line 39, <GEN2> chunk 1. Use of uninitialized value $template in exists at /usr/share/perl5/Debconf/Template.pm line 81, <GEN2> chunk 2. Use of uninitialized value $item in exists at /usr/share/perl5/Debconf/DbDriver/Cache.pm line 39, <GEN2> chunk 2. Use of uninitialized value $template in exists at /usr/share/perl5/Debconf/Template.pm line 81, <GEN2> chunk 3. Use of uninitialized value $item in exists at /usr/share/perl5/Debconf/DbDriver/Cache.pm line 39, <GEN2> chunk 3. Use of uninitialized value $template in exists at /usr/share/perl5/Debconf/Template.pm line 81, <GEN2> chunk 4. Use of uninitialized value $item in exists at /usr/share/perl5/Debconf/DbDriver/Cache.pm line 39, <GEN2> chunk 4. Use of uninitialized value $template in exists at /usr/share/perl5/Debconf/Template.pm line 81, <GEN0> chunk 1. Use of uninitialized value $item in exists at /usr/share/perl5/Debconf/DbDriver/Cache.pm line 39, <GEN0> chunk 1. Use of uninitialized value $template in exists at /usr/share/perl5/Debconf/Template.pm line 81, <GEN0> chunk 2. Use of uninitialized value $item in exists at /usr/share/perl5/Debconf/DbDriver/Cache.pm line 39, <GEN0> chunk 2. As a consequent, the dialog asking to restart services on libc6 upgrade didn't show up and the question was invisible with the Dialog debconf frontend. From a user perspective the upgrade hanged. debconf will automatically fall back from the Gnome frontend to Dialog, then Readline, then Teletype, then Noninteractive, depending on which one appears to be usable first. The problem is that update-manager creates a VTE terminal to run things in for logging purposes, which does a good enough job of being a terminal that debconf has no realistic way to tell that it isn't supposed to use it due to it not actually being visible. In fact, the solution isn't obvious because the terminal *might* be visible (expanded terminal widget or whatever). My first thought was that perhaps libgtk2-perl had been removed during the upgrade, but no, that isn't so, and perl-base hasn't even been upgraded yet so this isn't a perl upgrade problem. So I'm a little puzzled at this point. Can't load '/usr/lib/perl5/auto/Pango/Pango.so' for module Pango: /lib/x86_64-linux-gnu/libc.so.6: version `GLIBC_2.14' not found (required by /usr/lib/x86_64-linux-gnu/libpango-1.0.so.0) at /usr/lib/perl/5.12/DynaLoader.pm line 192. Compilation failed in require at /usr/lib/perl5/Gtk2.pm line 31. BEGIN failed--compilation aborted at /usr/lib/perl5/Gtk2.pm line 31. Now, there's something else wrong, because the log shows the Gnome frontend failing to load even after the new libc6 has been unpacked. I think I'm along the right lines here, though. I have a suspicion that fixing bug 850264 may work around this in practice; the unsatisfied pre-dependency while trying to unpack libnih1 points to a problem in apt, and fixing that might well force libc6 to be unpacked earlier and hence avoid this problem. I wouldn't mind some confirmation of that, though. We've established on IRC that it isn't bug 850264 after all; but there is definitely an apt bug here, albeit possibly one fixed in precise that needs to be backported to oneiric. It wouldn't entirely surprise me if this had been fixed by the giant unpack/configure ordering rearrangement. Oh, false alarm, sorry. debconf fails to configure libc6:amd64 due to this bug, and *that's* what causes libnih1 to fail. Package libgdk-pixbuf2.0-0 is not configured yet. 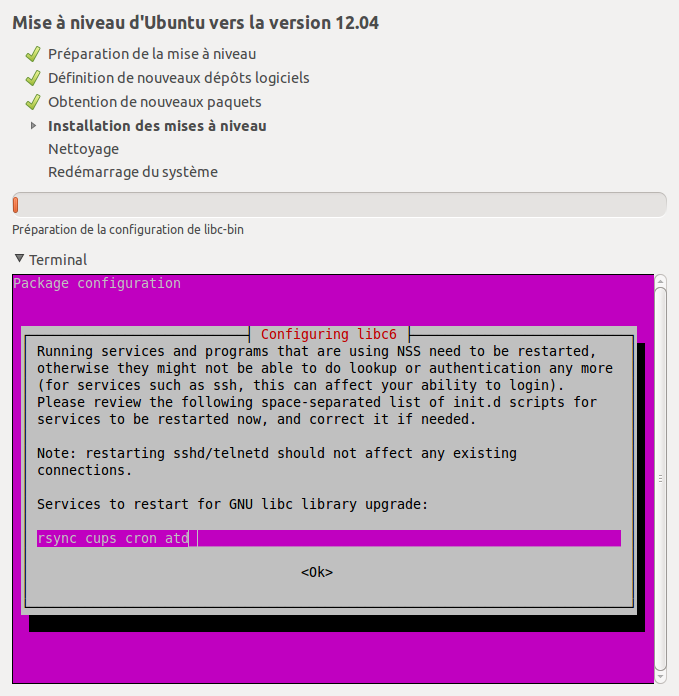 Package librsvg2-2 is not configured yet. Package gir1.2-gdkpixbuf-2.0 is not configured yet. Hi Tim, thanks for reporting. Your problem is caused a package failing to configure, either libgdk-pixbuf2.0-0 or one of its dependencies. Perhaps your issue is related, perhaps not. You could open a new bug report for this (and provide the full log, because this is not enough to analyse it fully). i'd like to know if what i experienced on 3 different updates in the last 2 days, is this bug or if something else needs to be reported? all 3 upgrades appeared to freeze at the point: "Preparing libc6". in the bottom of the update window, there is an option to show details with a little arrow thing next to it....i had to click the arrow to reveal the terminal window below, and there i saw that the update/install was actually prompting me to reply to some question (i cannot remember exactly what it was, so i will not try to guess), i needed to reply by saying "ok"....i did that by pressing the "tab" key. that highlighted the word "ok" in the terminal, then i pressed "enter" on my keyboard to complete and continue. the update would not continue unless i replied to the question. it sat, apparently frozen waiting for me to press "show details" and answer the question. there are 2 or 3 more such prompts before the update completes. the good news is....the upgrades went flawlessly after that on all 3 computers: a lenovo T61 thinkpad, a lenovo t410 thinkpad, and a lenovo k330 ideacentre desktop. ...i think the update should open the terminal window automatically when it gets to that point (Preparing libc6? ), as a new user will not know enough to open the "show details" window to reveal the prompt and continue. > last 2 days, is this bug or if something else needs to be reported? Yes, this is exactly the same bug. that, which seems to be failing. thanks steve, i have never tried repoting a bug before...hope my explanation was sufficient and helps some others. i have seen a few threads in the forums which sounded like those who encountered this same "freezing" episode eventually gave up, and pressed the power button to restart....leaving them with a unbootable system. > to do that, which seems to be failing. Note that the terminal window may also not be visible due to bug #663457 (screen captures attached). Here is a screen capture of the blocking Debconf dialog that appears during the upgrade on an amd64 system (I have upgraded 2 computers so far and have not seen that on the i386 one): this is during the libc upgrade. At that moment the glibc does not seem to be available (I have not been able to launch the usual screen capture applications because Gtk relies on glibc so I did use xwd for the capture), so that's probably the reason of the Debconf dialog downgrade. Combined with #663457 this is a major issue on netbook systems. 08:56 < mvo> this one? Would an alternate solution be to timeout the dialog after a long wait ( >300s), and for libc to either restart the service or ignore the dialog ? position to be able to have any remote idea whether a timeout is safe. This happened to a friend this morning. Luckily I was able to point the issue out to him. I'm sure this was fixed at one point and has regressed again. This is fixed in quantal, but there doesn't seem to have been a changelog ref for it. I can confirm that upgrading from 11.10 to 12.04 will auto expand terminal dialog if upgrade idles in excess of 300s. I am confused. This is listed as being fixed in 1:0.156.14.2 in precise-proposed, but then the latest upload in the queue, 1:0.156.14.6, claims to fix it again. Is that a type-o in the changelog or did the issue actually not get fixed in the previous upload? If its a type-o, then the upload needs to be re-done. If it wasn't actually fixed in the previous upload, then that should probably be noted in the changelog. Accepted update-manager into precise-proposed. The package will build now and be available at http://launchpad.net/ubuntu/+source/update-manager/1:0.156.14.6 in a few hours, and then in the -proposed repository. So I'm confused as to how this could have been fixed already in precise, given that the changes in DistUpgradeViewGtk3.py to support this were backed out as a result of the 1:0.156.14.5 security update. It's possible that when Adam tested, he did so against the right (precise-proposed) release-upgrader tarball to allow this to work, but that's definitely all superseded now by the security update - hence the new SRU upload. A diff against precise-updates confirms that 1:0.156.14.2 is not part of the revision history of the currently published package. Hence the new SRU. After having install the version of update-manager from precise-proposed I updated libreoffice, and a bunch of mono packages with no issue. @Brian: I don't think upgrading packages on precise verifies of a bugfix for an oneiric-to-precise dist-upgrade issue. I couldn't reproduce the original issue and tried to force it by removing libgtk2-perl but in that case the terminal opens directly when installation of packages starts. Despite this, I did 3 upgrades from Oneiric to Precise with version 1:0.156.14.6 from -proposed and didn't see any regression.